It’s silly, I bought it right away during the sale (which required applying for and getting a Nordstrom’s credit card in short order), but haven’t posted the pictures until now. Shadow is the polish that I was most excited about, because of its pretty shimmer. It’s a dark plummy purple, with reddish shimmer. The formula was nice although I did use three coats to be sure it was fully opaque. The shimmer is not quite as evident on the nail as I was hoping, but it’s still pretty. You can see the trail of shimmer down the middle of the bottle, and in the sun it does show up. 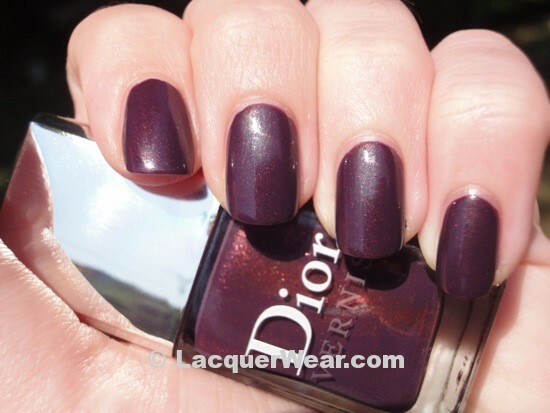 Shadow is a pretty purple that looks dark but has that bit of shimmer to lighten the color. 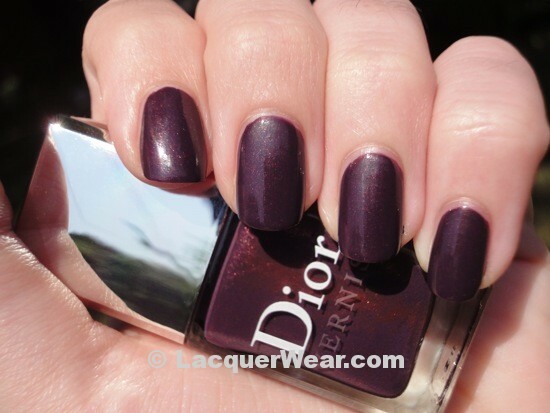 The Les Violets are still available on Dior.com and were also on Nordstrom’s the last time I checked. this one never got to the stores in my country, which is a shame. it’s a beauty.